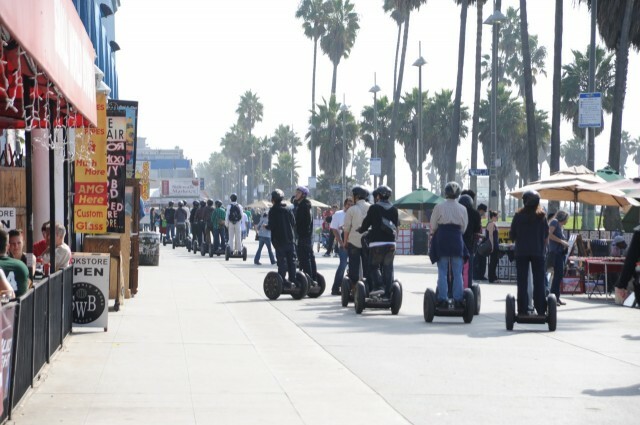 The Los Angeles City Council has passed an ordinance to ban Segways and other similar vehicles from the Venice Beach boardwalk. Accidents involving the two-wheeled electronic vehicles have reportedly been on the rise. “A lot of folks have begun to use Segways to get around on the boardwalk, and it’s just too damn crowded. And the cops have been reporting a lot of accidents,” Councilman Mike Bonin, who proposed the ban, told the press. One incident in particular is getting a lot of attention. Barbara Duffy, a former Venice Boardwalk merchant, says she broke her hip when she was knocked down by a woman riding a Segway nearly a year ago. "I lost 32 days of work in the middle of the season. I had a store," Duffy said. Duffy says the crash was one of the reasons her dress shop eventually went out of business. Supporters of the ordinance argue that Segways are similar to bicycles, which are already banned from the boardwalk and must stay on a separate bike path. The council passed the ordinance in a 14-0 vote. There is an exception for those with disabilities, and Segways are still permitted on bike paths.